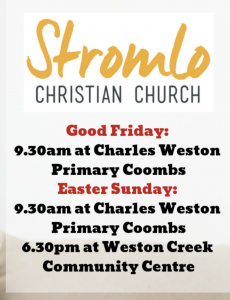 On Sunday mornings at 9:30am we gather for church at Charles Weston Primary School in Coombs (80 Woodberry Ave). Good Friday – Is the Message of Easter Fake News? Please join us at 9:30am each Sunday morning in the Hall at Charles Weston School, 80 Woodberry Ave, Coombs. A family-friendly service with a kid's program for children 1.5 years old - High School Year 10. If you would like an event or news item published, please complete the send us a message form and select “News and event promotion” in the “Regarding” field. NB. a request is not a guarantee that it will be published.